an engineered design. Proper installation, however, is still a critical factor in the safe operation of these units. Q. What is a factory-built fireplace? 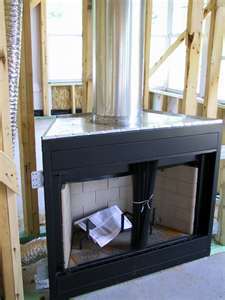 has a specific chimney that is appropriate for use with that specific fireplace. hot walls, picking up heat and forcing it back into the living space. Q. How is a factory-built fireplace different from a traditional fireplace? placed closer to combustible materials than their masonry counterparts. alternative to the relatively inexpensive materials and construction of the mass-produced factory-built fireplace. Q. What’s the safest way to use a factory-built fireplace? exists, be sure that it is open before you light the fire. •Don’t overload the fireplace. If you do, burning logs could roll out. Never use wet or green wood. listed for that particular fireplace. It can be dangerous to use the wrong set of glass doors on your fireplace. •Never start a fire with liquid fire starters, i.e. gasoline, kerosene, etc. the joints of the chimney to separate or the metal to warp. Protection Association and the Chimney Safety Institute of America. Q. How long will a factory-built fireplace last? components that are necessary to maintain the listing are no longer available. Q. How can I be sure the factory-built fireplace is installed correctly? the system was installed according to code. the manufacturer’s installation instructions should be followed to the letter. Q. Where can I install a factory-built fireplace? fireplace and combustible materials, affords homeowners a wide range of design and placement choices. Q. What if the lining of my firebox is cracked? be inserted into the crack or when the surface of the refractory panel has abraded more than 1/4" from the original surface. Q. What does a factory-built fireplace look like? Factory-built fireplaces are available in styles as varied as housing styles around the world. although many manufacturers offer them dressed with brass trim. Q. Can I have a gas log set installed in my factory built fireplace? blocked completely open and they are treated as a fully vented gas log set. FIREPLACE GIVE US A CALL TODAY!